Libraries play an important role when developers decide to work in machine learning or deep learning researches. 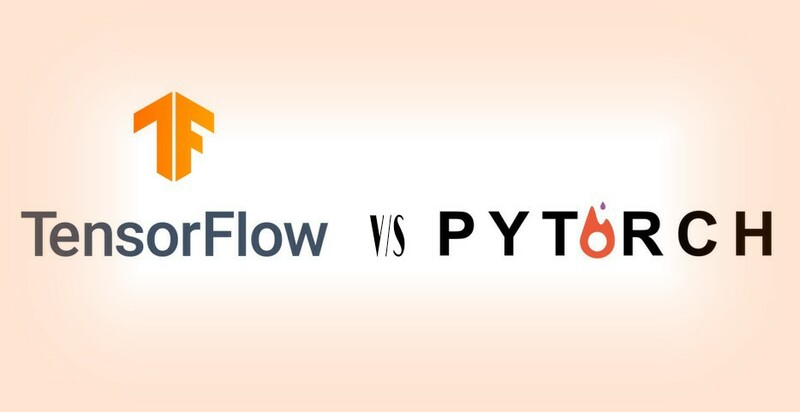 According to this article, a survey based on a sample of 1,616 ML developers and data scientists, for every one developer using PyTorch, there are 3.4 developers using TensorFlow. In this article, we list down 10 comparisons between these two deep learning frameworks. PyTorch has been developed by Facebook which is based on Torch while TensorFlow, an open sourced machine learning library, developed by Google Brain is based on the idea of data flow graphs for building models. TensorFlow has some attracting features such as TensorBoard which serves as a great option while visualising a machine learning model, it also has TensorFlow Serving which is a specific grpc server that is used during the deployment of models in production. On the other hand, PyTorch has several distinguished features too such as dynamic computation graphs, naive support for Python, support for CUDA which ensures less time for running the code and increase in performance. TensorFlow is adopted by many researchers of various fields like academics, business organisations, etc. It has a much bigger community than PyTorch which implies that it is easier to find for resources or solutions in TensorFlow. There is a vast amount of tutorials, codes, as well as support in TensorFlow and PyTorch, being the newcomer into play as compared to TensorFlow, it lacks these benefits. Visualisation plays as a protagonist while presenting any project in an organisation. TensorFlow has TensorBoard for visualising machine learning models which helps during training the model and spot the errors quickly. It is a real-time representation of the graphs of a model which not only depicts the graphic representation but also shows the accuracy graphs in real-time. This eye-catching feature is lacked by PyTorch. In TensorFlow, defining computational graph is a lengthy process as you have to build and run the computations within sessions. Also, you will have to use other parameters such as placeholders, variable scoping, etc. On the other hand, Python wins this point as it has the dynamic computation graphs which help id building the graphs dynamically. Here, the graph is built at every point of execution and you can manipulate the graph at run-time. PyTorch being the dynamic computational process, the debugging process is a painless method. You can easily use Python debugging tools like pdb or ipdb, etc. for instance, you can put “pdb.set_trace()” at any line of code and then proceed for executions of further computations, pinpoint the cause of the errors, etc. While, for TensorFlow you have to use the TensorFlow debugger tool, tfdbg which lets you view the internal structure and states of running TensorFlow graphs during training and inference. For now, deployment in TensorFlow is much more supportive as compared to PyTorch. It has the advantage of TensorFlow Serving which is a flexible, high-performance serving system for deploying machine learning models, designed for production environments. However, in PyTorch, you can use the microframework for Python, Flask for deployment of models. The documentation of both frameworks is broadly available as there are examples and tutorials in abundance for both the libraries. You can say, it is a tie between both the frameworks. Click here for TensorFlow documentation and click here for PyTorch documentation. The serialisation in TensorFlow can be said as one of the advantages for this framework users. Here, you can save your entire graph as a protocol buffer and then later it can be loaded in other supported languages, however, PyTorch lacks this feature. By default, Tensorflow maps nearly all of the GPU memory of all GPUs visible to the process which is a comedown but here it automatically presumes that you want to run your code on the GPU because of the well-set defaults and thus result in fair management of the device. On the other hand, PyTorch keeps track of the currently selected GPU and all the CUDA tensors which will be allocated. A budding Technical Journalist who loves to take everything creatively. A lover of music, writing and learning something out of the box. When not writing, you can find her drawing or painting on a canvas or travelling.